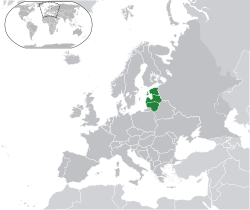 The Baltic states, an aa kent as the Baltics, Baltic naitions or Baltic kintras (Estonie: Balti riigid, Baltimaad, Latvie: Baltijas valstis, Lithuanie: Baltijos valstybės), are the three kintras in northren Europe on the eastren coast o the Baltic Sea: Estonie, Latvie an Lithuanie. ↑ "Report for Selected Countries and Subjects". Imf.org. October 2015. Retrieved 2015-10-09. This page wis last eeditit on 11 Dizember 2015, at 04:07.